This week’s featured car is a Certified Pre-Owned 2016 Honda CR-V! Honda Certified, CARFAX 1-Owner, Excellent Condition, GREAT MILES 15,538! PRICE DROP FROM $33,630. Modern Steel Metallic exterior and Gray interior. Navigation, Moonroof, Heated Leather Seats, Power Liftgate, Aluminum Wheels CLICK NOW! 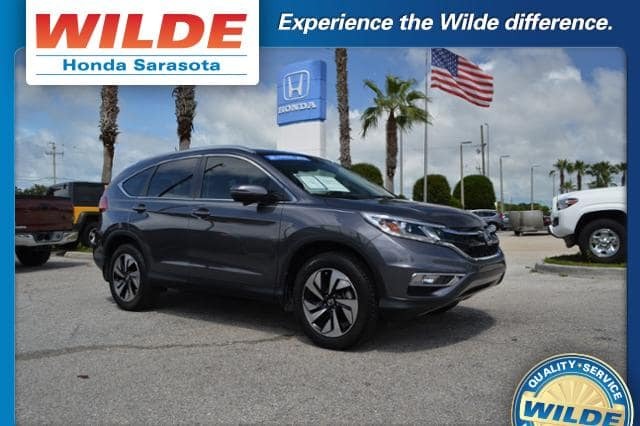 Leather Seats, Navigation, Sunroof, Power Liftgate, Heated Driver Seat MP3 Player, Remote Trunk Release, Keyless Entry, Privacy Glass Honda Touring with Modern Steel Metallic exterior and Gray interior features a 4 Cylinder Engine with 185 HP at 6400 RPM*. Edmunds.com’s review says Everyday usability is the driving force behind the CR-V’s interior design. The wide doors allow for easy ingress and egress, and head- and legroom are ample for front and outboard rear passengers..
Pricing analysis performed on 8/28/2017. Horsepower calculations based on trim engine configuration. Please confirm the accuracy of the included equipment by calling us prior to purchase.